A few weeks ago, I hosted an Introduction to Liberating Structures event for the Victorian Facilitators Network (VFN). It was a fun night, filled with energy and enthusiasm. More importantly, I learnt a lot. I first heard about Liberating Structures via Nancy White, who I hold in such high esteem. I was inspired by her own experiences and decided to explore this further. Hosting the VFN meeting—which I’ve always found to be a safe space to take risks and try new things with peers—was a great chance to investigate some easy structures, practice them with others, and to see what we could learn together. When I sat down to start planning and designing the event, I wasn’t quite sure where to start. 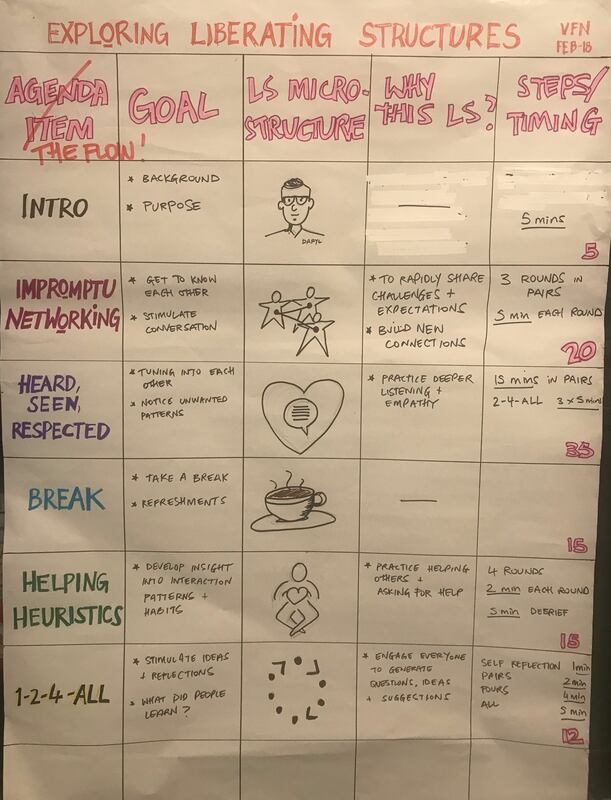 So, I used elements of the Design Storyboards structure to help me define all the elements needed to achieve the purpose, which was to introduce a few structures around the loose theme of ‘helping’. When planning this event, I did stop to ponder whether introducing Liberating Structures to other facilitators was going to be a waste of time. Prior to reading the book, I had not only heard of, but already used, a number of these methods or structures. I suspected many of my facilitation colleagues may have too. And this suspicion was confirmed. A number of people commented that they were familiar with many of the structures, and they didn’t quite understand how or why these these methods were being reframed, or repackaged as ‘Liberating Structures’. I must confess, I had similar concerns. It took me a while to grasp, but the real power and potential of Liberating Structures is that it takes the design and facilitation methods experts use (i.e. most of the people who were in the room, including me) and puts them within reach of anyone. How might it address the common problem of ‘scaling’ well-facilitated conversations? How does this provide our clients opportunities to grow and develop as as they take on expanded roles in a vibrant, spirited enterprise? Does this offer an opportunity to have a greater impact, and create more value for our clients? I sense that putting these methods within the reach of everyone would allow facilitators to elevate their status and role within organisations from simply running productive meetings, to helping liberate everyone’s contributions. I stuck to the suggested timing for each of the structures as closely as possible. Each activity felt like it was set at a breakneck pace. As a result, the whole 90 minutes seemed to fly past. At times throughout the night, I sensed that people may have felt rushed, and I expressed my concerns to a fellow organiser. We wondered whether this was indeed a deliberate ploy to move people away from the cerebral and into the creative? After this brief conversation, I decided not to intervene, to just go with the flow, and stick to the suggested timings. It may be due to the nature of the audience, but the desire to unpack things also kept showing up. People continuously wanted to analyse the situation and/or each of the processes in an explicit way. I was curious about this. By the end of the night, I had not only come to terms with the pace of the activities, I had embraced it. I resolved that the snappy pace is deliberate as it doesn’t allow time to over-think everything. And as someone with a tendency for over thinking, getting out of the theory and into the practical was a refreshing change. From a practical perspective, I can see how using Liberating Structures might prevent organisations from getting bogged down in details, and help them to quickly move towards decisions. This was an opportunity for me to be more proactive; to do stuff! To get out of the theoretical and into the practical. I’m hardly an expert in Liberating Structures, but rather than reading more books, blog posts, or attending a workshop to learn more, I created an opportunity to immerse myself and to learn by doing. All it took was the determination to experiment. It was a great reminder to do small things that get me closer to where I want to be. Even if it scares me. Especially if it scares me. Many thanks to all who participated and willingly came along for the ride. I’m grateful for supportive peers and a safe space to take risks.